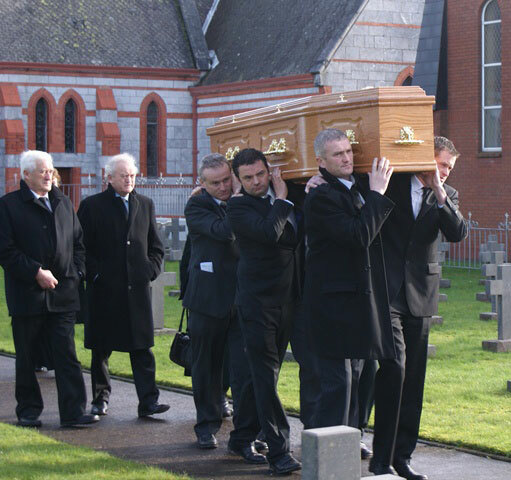 The SMA Provincial Leader, Fr Michael McCabe, was the Principal Celebrant at the Funeral Mass for Fr Michael McEgan who died on Wednesday, 18 June 2014. The Principal Concelebrants were four of Fr Michael’s classmates: Bill Foley, Hugh Harkin, John Quinlan and Andy O’Sullivan. The Readings for the Mass were Isaiah 25:6-9; Philippians 3:2-21 and John 14:1-7. After the Gospel Fr McCabe preached the following homily. Michael was a missionary priest who enchanted many people by his gentle presence and the witness of a life totally dedicated to living and proclaiming the free gift of the Gospel. Let us recall briefly some of the key moments of his life. Born in Ballyheigue, Co Kerry, on 1 April 1934, Michael was the fourth in a family of seven children of Michael and Mary Ann (née O’Connor) McEgan. The McEgan family were staunch Catholics and Michael received a firm grounding in the Catholic faith from his earliest years. With three aunts and a sister in Religious Life, and also a grandaunt in the OLA sisters, it was not surprising that, following his primary and secondary education, at the age of 19 years, he decided to become a missionary priest. In 1953, he entered the SMA Spiritual Year programme at Cloughballymore, Kilcolgan, Co Galway, and took his First Oath of membership in the Society on 26 June 1954. From Cloughballymore, Michael was sent for studies to Cork University College and, in 1957, was awarded a Bachelor of Arts degree in Latin and Philosophy. From Cork he moved on to the seminary of the African Missions in Dromantine, Newry, where he undertook his theological studies and further training for Priesthood. He became a permanent member of the Society on 14 June 1960 and was ordained a priest by Bishop Eugene O’Doherty in the Cathedral of Saints Patrick and Colman on 21 December 1960. 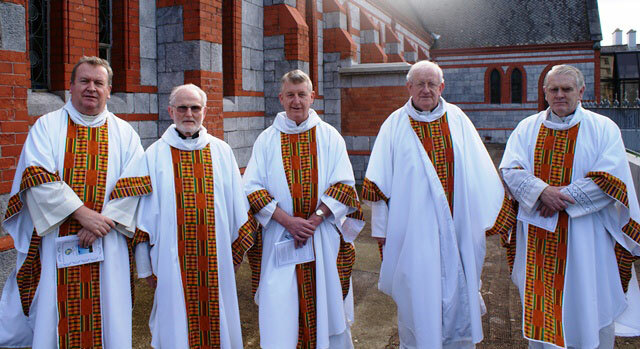 Our picture shows three of his classmates, from left, Frs Bill Foley, John Quinlan and Hugh Harkin. On right is Fr Andy O’Sullivan who worked with Fr Michael in Ondo diocese. Following Ordination, Fr Michael was appointed to Ondo diocese where he served from 1961 until ill health forced him to return to Ireland in 1988. His first appointment was to the teaching staff of Annunciation College, Ikere-Ekiti, where Fr Sean MacCarthy SMA was the founding Principal. However, most of his active life was devoted to parish ministry, in Ondo and Cork & Ross dioceses. During his 27 years in Ondo diocese Fr Michael worked in two parishes in Ondo Town. He also served in parishes in Oka, Owo, Ikare-Akoko and Sobe. While in Sacred Heart Church, Sobe (1984 – 1988) Fr Michael was noted for his care and concern for everyone, especially Ghanian immigrants who were, at that time, threatened with repatriation. In 1988, ill health forced Fr Michael to leave Nigeria and return to Ireland. After a period for recuperation, he was appointed to Ballyroe parish, Courtmacsherry, in the diocese of Cork and Ross. During the three years he ministered in that parish, Fr Michael endeared himself to the people, young and old, by the exemplary quality of his life and loving service of the people. 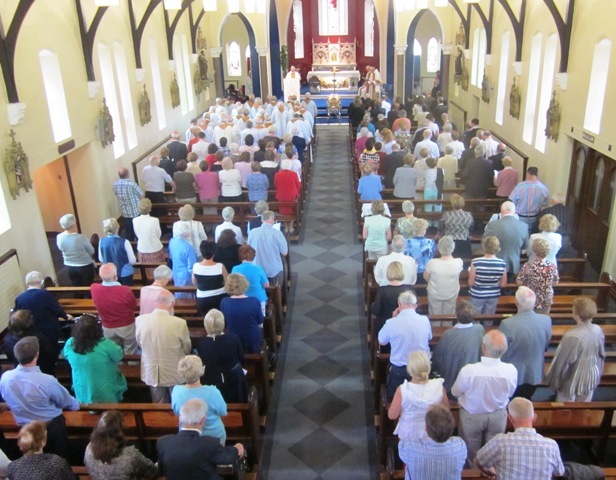 Following his transfer from Ballyroe parish to Blackrock Road – again due to failing health – one of the parishioners paid the following tribute to Fr Michael in a letter to the then Provincial Superior: “His coming to Courtmacsherry was an answer to prayer, and the hand of God was in his appointment. His sincerity and prayerfulness touched us all… He constantly visited people in their homes, and knew everybody from the youngest child to the oldest in the house… He was very familiar, too, with our non-Catholic friends and visited them in their homes also – something which I know they very much appreciated… He constantly encouraged us to ‘Put God first in our lives’ – as he did himself”. Fr Michael took a particular interest also in the youth of the parish and, with his guidance and encouragement, a Foroige youth club was formed and went from strength to strength, winning a national award the week before he left the parish. From 1991 until 2007, Fr Michael served in St Joseph’s SMA parish, Blackrock Road, first as Curate and later, as increasingly poor health limited his physical abilities, as Parish Assistant. While serving there he continued to visit the people of the parish in their homes as well as visiting the sick in hospital and nursing homes. In early 2007, Fr Michael retired to Blackrock Road where he was well cared for by the staff in St Theresa’s and also by a great friend of his and the SMA, Miss Margaret O’Regan. He died peacefully in St Theresa’s Nursing unit on Thursday evening, 18 June. Fr Michael suffered frequent bouts of ill health throughout his life and his later years in retirement were marked by a debilitating condition which rendered him dependent on his carers. He bore his suffering with great patience and fortitude, never complaining or wanting to be a burden on those caring for him. We will soon accompany his mortal remains to the cemetery in Wilton, where his grave will be marked with a little stone cross giving his name and date of death. His true monument is the countless souls whom he helped on their way to God. May we draw inspiration from the example of his life of dedicated priestly and missionary service.